How to watch DVD movies on iPhone X? If you’re looking for the best way to copy DVD movies to iPhone X, this article will give you what you really want. With the powerful DVD ripping program, you can keep any DVD at one go. Addicted to DVD movies? I believe you should have also encountered some annoying things. For instance: it takes too much room to store our DVDs especially when we have a growing number of DVD discs which cost us a lot. You know, inevitably, the Blu-ray discs may be scratched and damaged if we do not place them properly. Or someday want to watch a favorite old DVD on a whim but have to spend several hours to find it out. It’s so terrible. To avoid such troubles again, we need an ultimate solution. That is, we should copy DVD to our computers. I just got the iPhone X, then how to rip DVD to iPhone X? You may get several quick answers on how to copy DVD to laptop or PC after you turn to some pop technical forums like videohelp, afterdawn, etc or get feedback from Search Engines, but to find that it isn’t as easy as you think to rip DVD to iPhone X. Don’t worry! With a DVD ripping software, the whole process will be much easier. 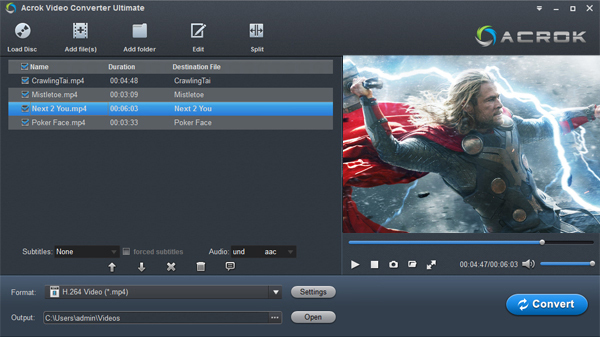 Acrok Video Converter Ultimate (Best DVD/Blu-ray to iPhone X Converter) stands out for its powerful and attractive features among numerous similar programs for copying and converting DVDs. It not only allows you to copy DVD to smartphone at fast speed and high quality, but crack any copy protected DVD completely to 250+formats and hot tablets and samrtphones. If you plan to get a Blu-ray rippong software recently, please read Blu-ray Ripper Review to get best one. With the help of Acrok DVD Ripper, you can easily copy DVD to iPhone X by following the simple steps below. How to watch DVD movies on Your iPhone X? Insert the DVD disc into your DVD Drive that connected to your PC or Mac, and then click “Load Disc” button on the top left to select and load the DVD movies you want to play on your iPhone X. DVD, ISO, IFO files are also supported. After the movies are loaded, you can preview them on the right viewing window and adjust volume or take snapshots freely.In addition, you can select your preferred subtitle and audio track. Press the “Format” button and choose a video format or device. In most cases, MP4 format is recommended to users. It could fit on your iPhone X. When all settings are OK, click “Convert” on the main interface to begin ripping DVD movies to MP4 video files for your iPhone X. When the conversion is done, click “Open” to locate the ripped videos. After that, just enjoy your DVD movies on iPhone X without the disc!